It has been an honour and a great privilege to welcome to Sri Lanka the Minister of Foreign Affairs of the People’s Republic of China, H.E. Wang Yi. The visit is significant as it is the first high level visit and the first visit by a Foreign Minister of China, following the formation of the National Unity Government in Sri Lanka. Sri Lanka has also made several high level visits to China in the recent past, with H.E. President Maithripala Sirisena making a State Visit to China in March 2015, a mere three months after being elected and then it was followed by the Visit by Prime Minister Ranil Wickremesinghe to Beijing. I myself had the pleasure of visiting China four times in one year, on your invitation, and the last being the CICA Conference (Conference on Interaction and Capacity Building Measures in Asia) held a few months ago. I am confident that the visit by the Foreign Minister will further enhance the warm and friendly bilateral relations between our two countries and pave the way for stronger ties in all spheres of cooperation between Sri Lanka and China. We have just concluded a very productive discussion regarding the consensus reached by the leadership of our two countries during the recent high level bilateral visits and also on issues of mutual interest. I extended Sri Lanka’s appreciation for the assistance given by China for several infrastructure and other mega projects in Sri Lanka. This is consistent with the Strategic Cooperation Partnership between our two countries. Sri Lanka deeply values the long standing friendship and cooperation with China, dating back from ancient times. Discussions were also held regarding the Belt and Road initiative put forward by China. Sri Lanka reiterated its participation in this initiative, as it is in line with the Government’s initiatives to make Sri Lanka the hub of the Indian Ocean trade, a position it occupied in the ancient past. We discussed the 21st Century Maritime Silk Road for greater economic cooperation, which is viewed as a road of friendship, economic cooperation, socio and cultural exchange and connectivity. We also agreed to further enhance cooperation in the field of trade, which we hope will be achieved with the early conclusion of the FTA between our two countries. Sri Lanka also welcomes the active support from Chinese enterprises towards the development of Sri Lanka’s economy. While recognizing the need to maintain peace and security in the region, we also agreed on the importance of maintaining peace and stability in the South China Sea. 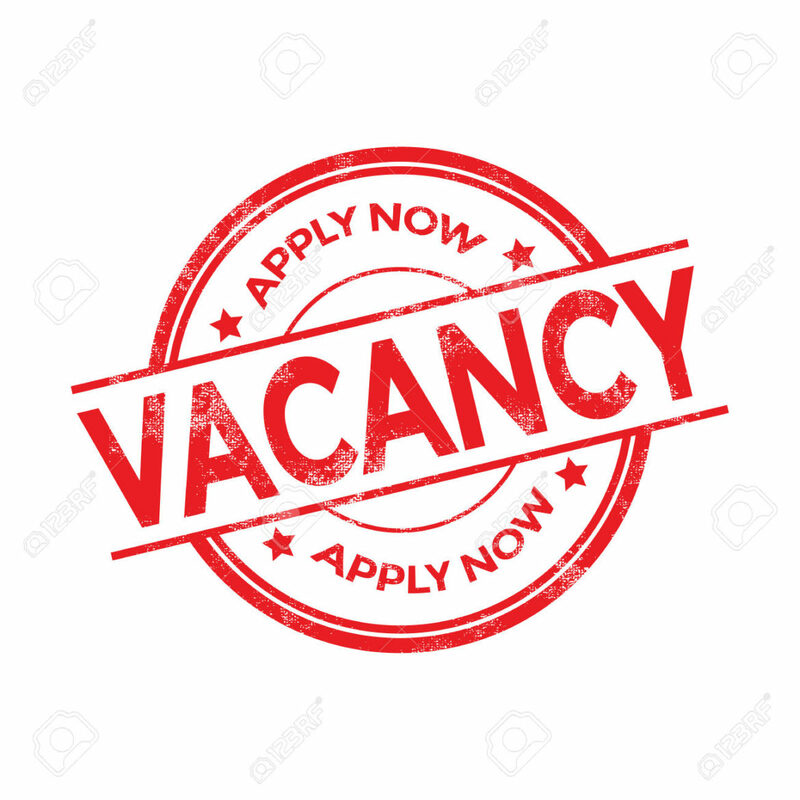 In this regard, Sri Lanka calls for the settlement of disputes and differences through constructive dialogue, consultation and cooperation by the parties concerned in accordance with international laws and practices. 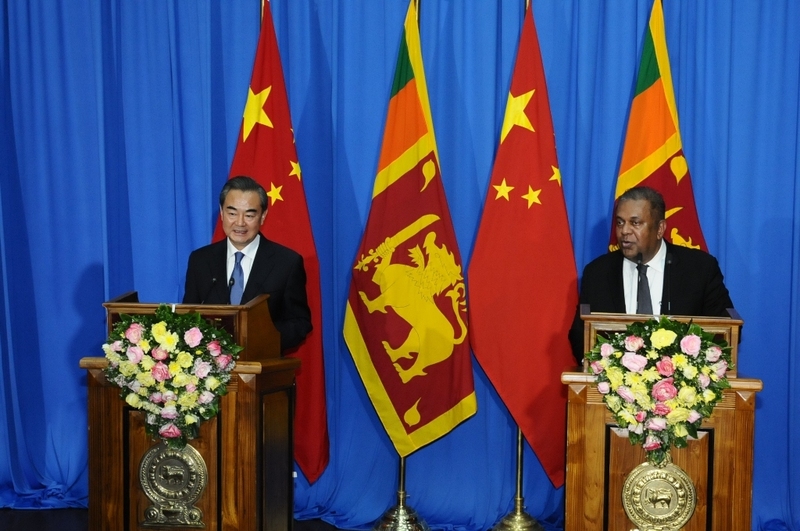 Sri Lanka also appreciates China’s efforts and readiness to promote such dialogue in order to maintain peace and security in the region while upholding the rule of law in inter-state affairs. We agreed that regular high level interactions at all levels will pave the way for a stronger relationship, which will benefit our countries and our peoples. Next year, in 2017, our two countries will be celebrating 60 years of the establishment of diplomatic relations and 65 years since the signing of the Rubber-Rice Pact. We look forward to working together to jointly celebrate this milestone to demonstrate the warm and friendly ties that exist between our two countries and Sri Lanka also hopes to have a Festival of Sri Lanka in Beijing, next year. Later today, Minister Wang Yi will pay a courtesy call on H.E. 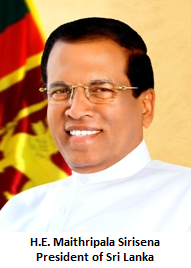 President Sirisena and tomorrow, on Saturday morning, will hold discussions with Hon. Prime Minister Ranil Wickremesinghe. I am confident that these discussions will further elevate our relations to greater heights and promote cooperation in areas of mutual interest. So let me take this opportunity again to thank the Minister for his visit to Sri Lanka, a very brief visit indeed and I hope that next time he comes, he comes for a longer period so he can see the true beauty of our little island and I also take this opportunity to thank my Ministerial colleagues here, who were associated with me in the bilateral discussions held a little while ago, Hon. Ravi Karunanayake, the Minister of Finance and Hon. Malik Samarawickrama, the Minister of Minister of Development Strategies and International Trade and also would like to thank the former Governor and former Foreign Secretary Palihakkara, as well as former Ambassador Gunaratne who participated in these discussions.